This half day workshop provides an overview of cold-process soap making geared to beginning soapmakers, whether you are a complete novice or tried a batch or two on your own. To schedule a group class, you'll need a minimum of three participants (and no more than six participants). Additional participants can be added up to 24 hours prior to the workshop for $75.00 each (see below) up to six participants. 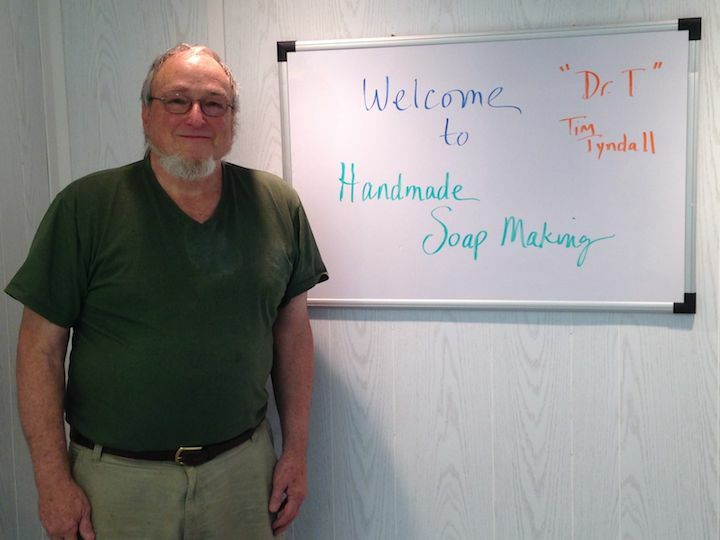 The workshop fee includes a day with Dr.T, a retired science professor who will provide class lecture, demonstration & supervise your soap production over three hours time; lunch, beverages and snacks; all supplies and materials needed for class (oils, butters, lye, fragrances, safety goggles, gloves, aprons, and soap mold to take your soap home) and the Workshop Workbook including classroom lecture notes, helpful online resources, and recommended soap making suppliers. You will make your own first batch of soap to take home with you. This general outline can be modified in many ways to meet your needs. If you'd like to send your ideas to us via email (info at soapshed.com) or speak to us via phone prior to your registering online, feel free to do so. Just fill out our Contact us form, or call us. You'll find a link to our Contact Us form and our 800 number listed in the top right of every page on our website. We will provide all Supplies and Materials you need for the workshop, including safety goggles, gloves, aprons and molds. Please wear old clothes so if you splatter olive oil or butters on them, you won’t be heartbroken. Long sleeves, full length pants and closed toed shoes protect your skin best from sodium hydroxide (lye) so please wear them. Three hours on our agreed-upon date and time. You can register for this Workshop by putting it in your shopping cart and checking out here on soapshed.com. You may also pay by check or money order in the required amount and mailing it to The Soap Shed, 179 Meadow View Road, Spruce Pine, NC 28777. Payment may also be made at The Soap Shed retail shop if you are scheduling onsite.